What if one day you just don’t show up for your dog? We let them in and out. What would happen to your dog if you just didn’t show up one day? Arguably not the most pleasant topic to think about, but many of our fabulous dogs stay at home alone. No one else is involved in looking after them. And no one may know that they are there. Wouldn’t it be nice to know that if you were unable to make it home to your dog that someone reliable would be contacted to go and see to the needs of your pack? That’s why I’ve made this card. 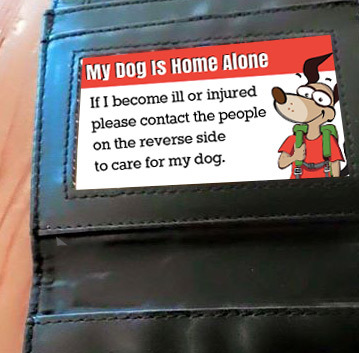 Just print it out, write the contact details of an emergency guardian for your dog on the back, and pop it into your wallet. In the case that something unexpected happens your dog will be sorted! All the very best and safest to your pack! Looking for a dog friendly rental property? March 11, 2016 | Filed under Uncategorized.